Loading the stick…is where…the power…comes from. When lining up the puck put it about two – three feet in front of you and about [two] inches behind your front skate. 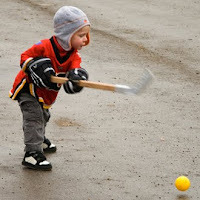 When taking the shot you want the blade of the stick…in the middle of your stance, this gives your stick time to flex… remember to stay low and trust your stick, you need to throw most of your weight (the more the better) onto your stick. This will allow you to increase the power on your shot without the huge windups. No matter how good this advice is, it is merely a starting point for practice. Don’t expect that after absorbing this information you will burn a hole in the net on your first try. Practice, practice, practice. Good luck, you’ll be shooting rockets like Fulton Reed in no time. This entry was posted on on March 15, 2010 at on March 15, 2010 and is filed under shooting. You can follow any responses to this entry through the RSS 2.0 feed. You can leave a response, or trackback from your own site.